Televue 1.25" 20mm Plössl eyepiece. While the Plössls may be our least expensive eyepiece line, they still enjoy the same care and attention to detail as our most expensive. TeleVue continues to believe that quality, performance and consistency will ultimately reward you with the most value for your money. Diffraction limited "on-axis" performance is a given. Using more expensive high-index glasses to reduce astigmatism and lateral color at the field's edge, TeleVue Plössls deliver sharper images than any other brand of 4 or 5 element "Plossl" or Orthoscopic designs. The faster the focal ratio of your telescope, the greater your visual reward for using Tele Vue eyepieces. TeleVue plossls feature full multicoatings for greatest light transmission and contrast. Blackened lens edges and internal anti-reflection threads tweak the last bit of contrast for maximum image detail. The sharper field focuses faint star light into perceptible points and allows those with undriven mounts to gaze longer before repositioning the image. Adjustable eyeguard for eyeglass wearers. 50o Apparent field of view. Work best with TeleVue Powermates to effectively double the number of focal lengths in your collection. 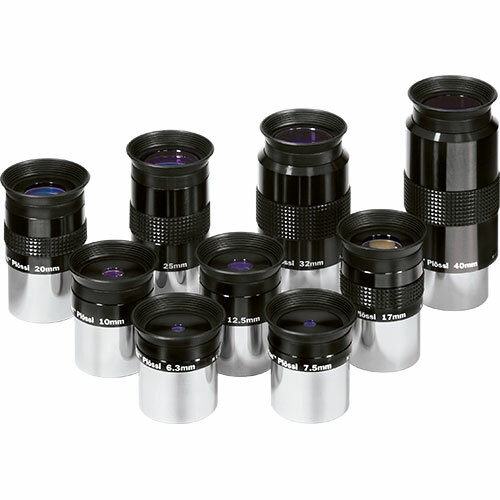 Far superior to eyepieces usually provided as standard with most instruments. For a bit more than generic brands, you can own a geniune TeleVue Plossl. Please enquire if stock is indicated as zero.